The FS-2500 Bypass Filtration System is shipped to you engine/chassis specific. Everything you need to install the FS-2500 comes in your kit. Not all applications are available through our online store. If you don't find what you need in our store, please call us toll-free at 888-440-9056. We have OTR, F/V, Construction, Ag, Hydraulics, City Buses and much more! At this time the only international shipping available through the store is UPS Standard. If you need your order shipped another way, please call us at 888-440-9056 and we will be happy to assist you. Spin On Filter Conversion Kit - MUST HAVE FS-2500 INSTALLED ALREADY! This is a CONVERSION kit only. You must already have the FS-2500 installed. 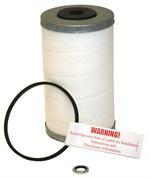 This is a 7" 15,000 mile/350 hour replacement filter to be ordered with the Spin On Conversion Kit.